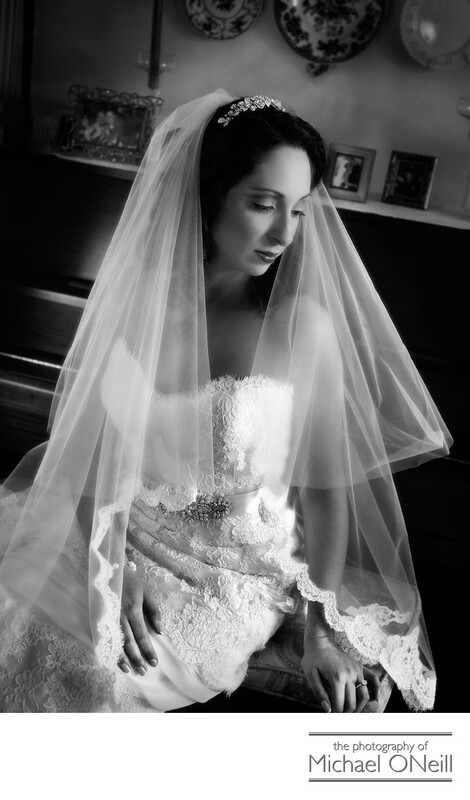 This classic black and white portrait was made at the bride’s house before her wedding mass at St. Catherine of Sienna RC Church in Franklin Square, New York. This is a natural light photograph being illuminated by window light streaming through the living room window. Her maid of honor and bridesmaids were behind me and couldn’t get over just how beautiful the bride looked. In a little while she would be walking down the aisle in church and her groom would see her for the first time in her wedding dress. After church it would off to Marina Del Rey in the Bronx for an amazing wedding reception. This bride was the first of two sisters to get married in less than a year’s time. It was great to return to this same house and photograph this wonderful family again. After a ceremony at the same church the second sister hosted her wedding reception at The Royalton Mansion at Roslyn Country Club.